Are You Protected Against The Summer Heat? As an insurance agency part of our job is to worry about the unforeseen accidents that can take place in any of our clients’ lives. During the summer, that means that we are worried about whether or not you have enough RV insurance and boat insurance to stay safe while having fun. It also means that we are thinking about your family and the risk that come when you are exposed to the summer heat. For example, did you know that every time you get a sunburn you are at a greater risk for developing skin cancer? According to the Skin Cancer Foundation, anyone with more than 5 sunburns has double the risk of melanoma than someone without. By simply using sunscreen you can help to reduce the likelihood of you developing cancer. 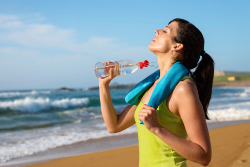 Another common health risk during the summer is dehydration. As a parent, this is something that you should be particularly concerned with since your children can easily become dehydrated while playing in the pool or running around with their friends. If they are outside and exercising they should have two to four glasses of water per hour. Even so, you should watch for standard signs of dehydration like extreme thirst, irritability, dry mouth and dry eyes, sunken eyes, body pain, etc. If you notice any of these symptoms give your child water immediately and call the doctor if they do not begin feeling better. During the hot summer months you also need to worry about heat stroke and make sure that no one in your family gets it. This is the most significant type of heat injury and is most definitely a medical emergency. If you think anyone has heat stroke, you need to call 911 right away so that they can go to the hospital because it can kill you or permanently damage your brain and organs. This is the type of accident that no one foresees ever happening to them. However, that is why you need to make sure that you have a life insurance policy in place. You never know when something is going to happen like a car accident or even heat stroke that could cause permanent damage or even death. Our job is to provide you with the solutions to protect your family in the event that a terrible accident does occur.